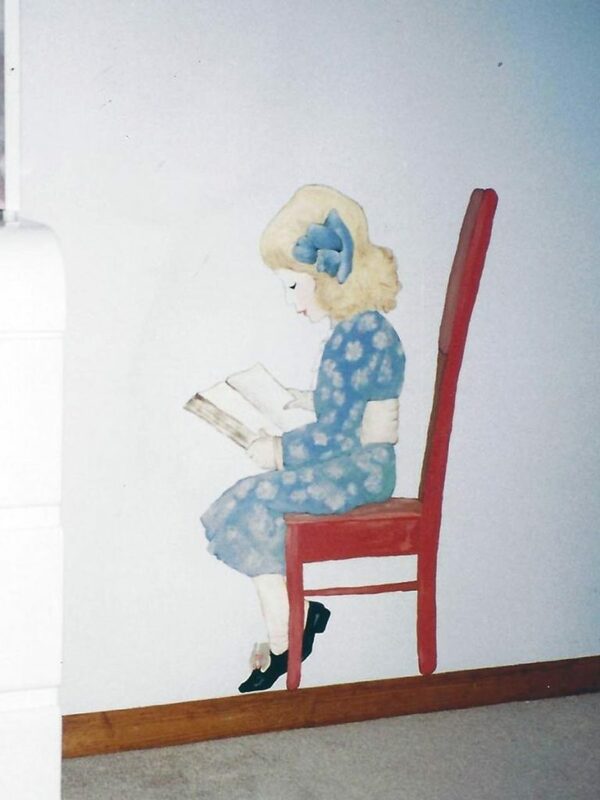 One of the best things about painting for so many years has been revisiting my clients over time, seeing their style evolve, and helping them as they redecorate or move into new homes. 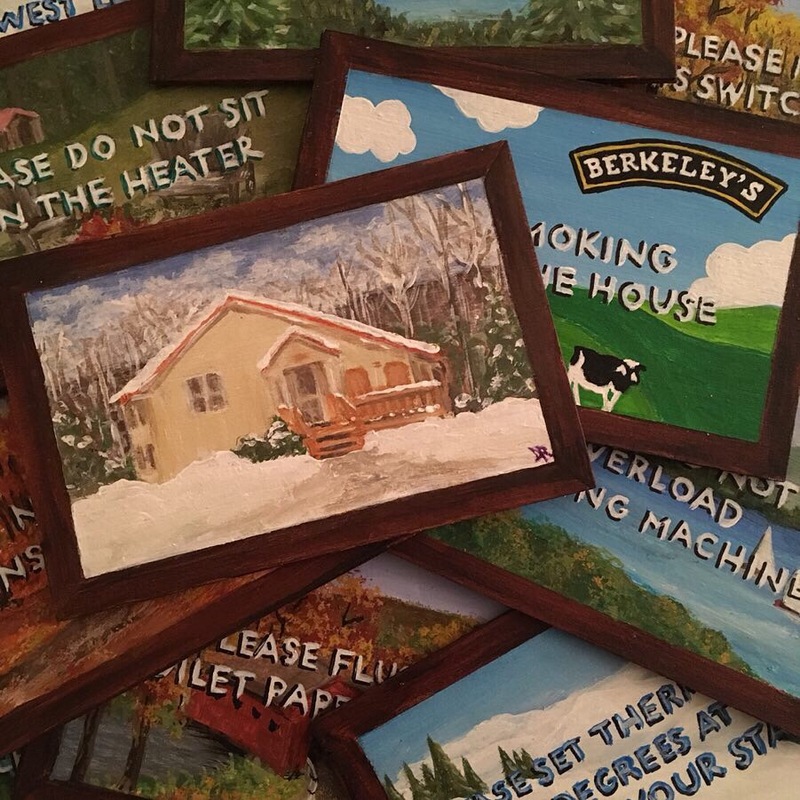 Most rewarding? 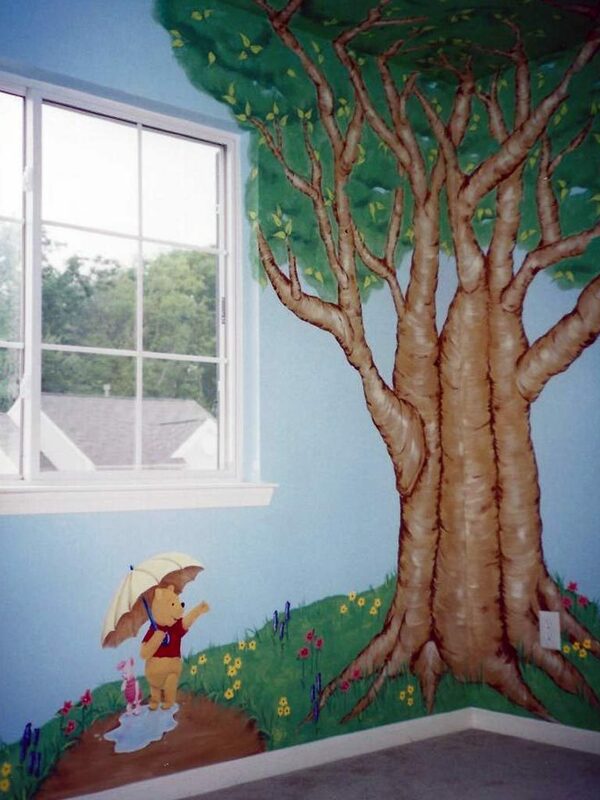 Painting something sweet for a new baby or young child and then coming back as they grow older to repaint something new! 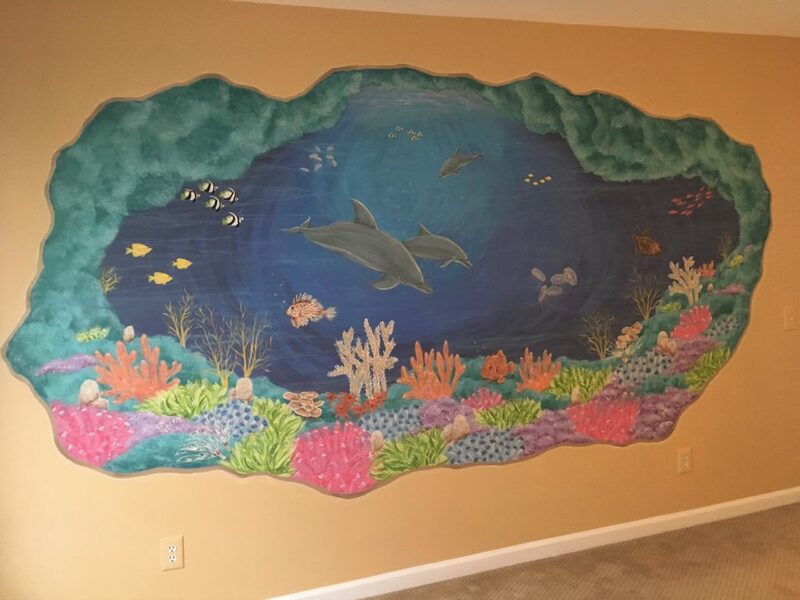 Here are a few of my favorite examples of kid’s room murals that I have painted for clients in the New Jersey and New York City area. 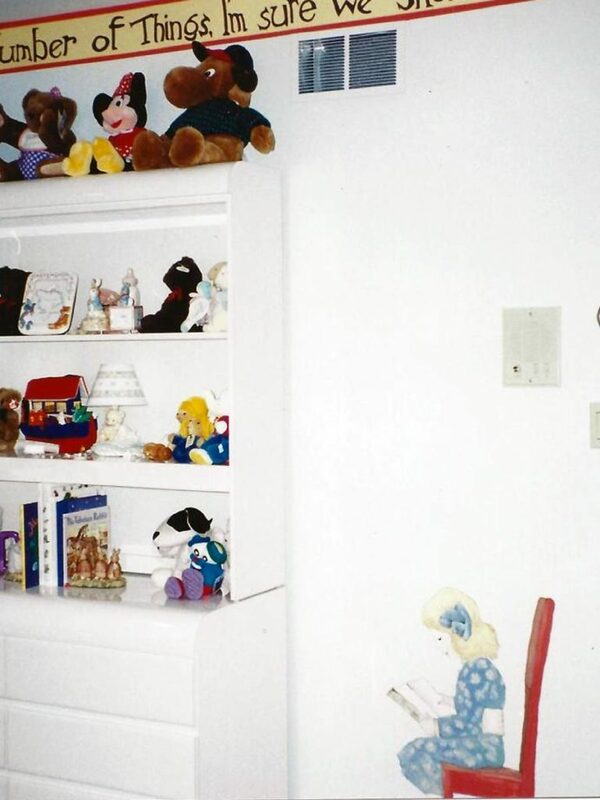 Click on any image for a broader view, and please excuse the pre-digital-era quality of some of the photos. 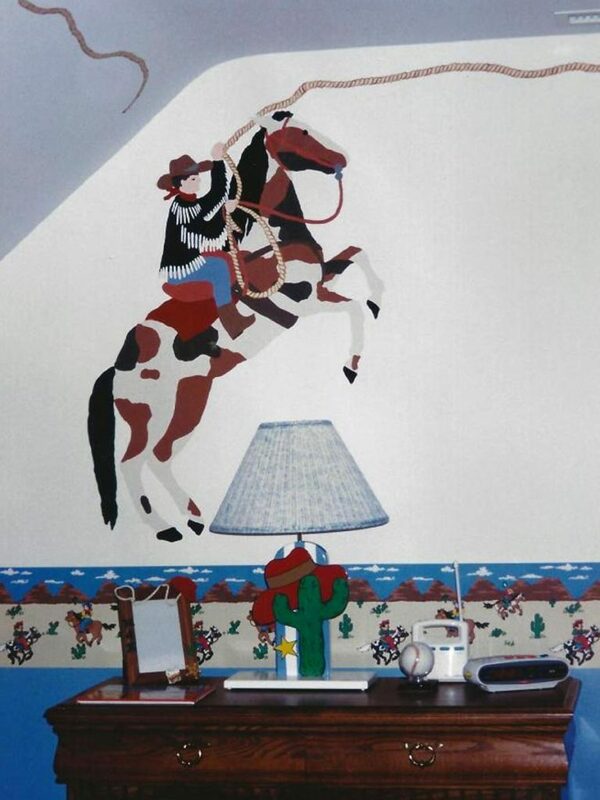 Cowboy on horse, with rope around the perimeter of the walls. 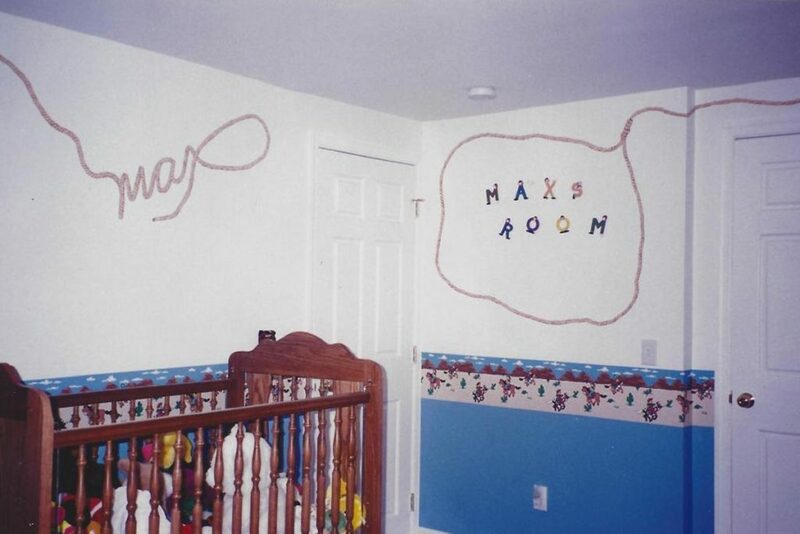 The rope detail continues around the room and spells out his name. The other end of the rope makes a loop. 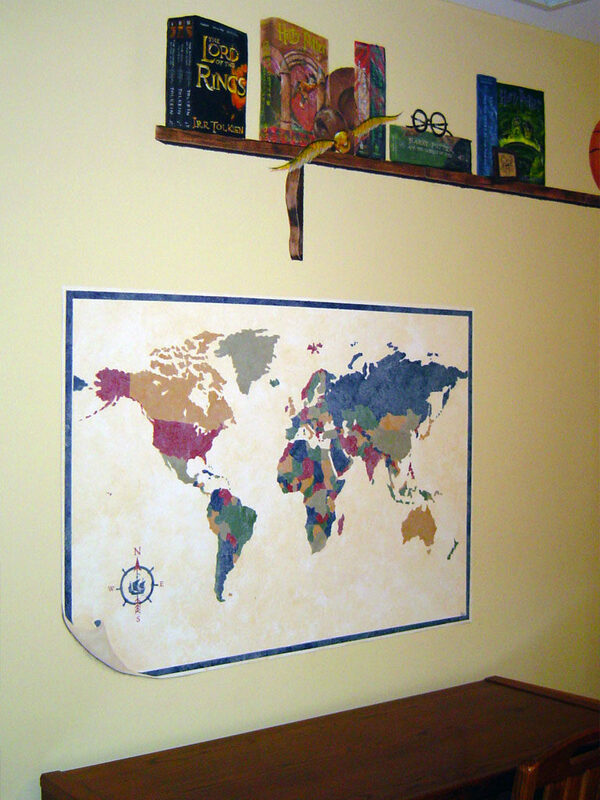 World map and painted shelf detail from Bedroom mural. 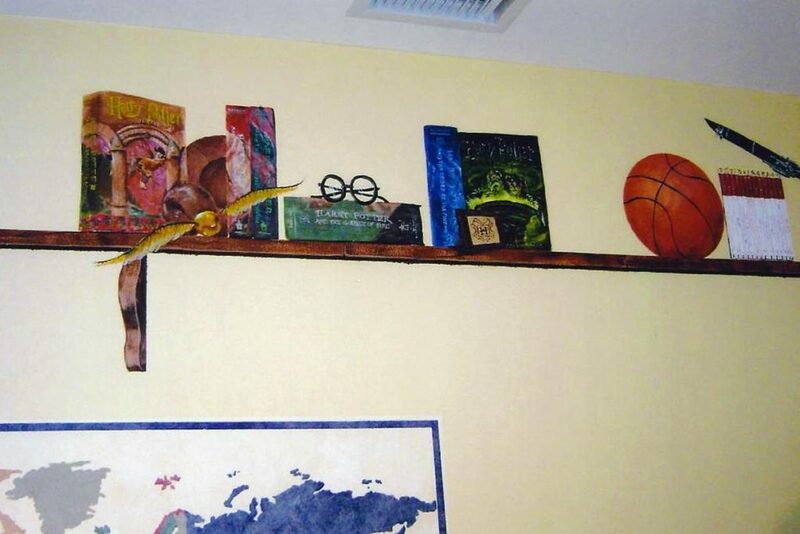 Additional view of the painted shelf. 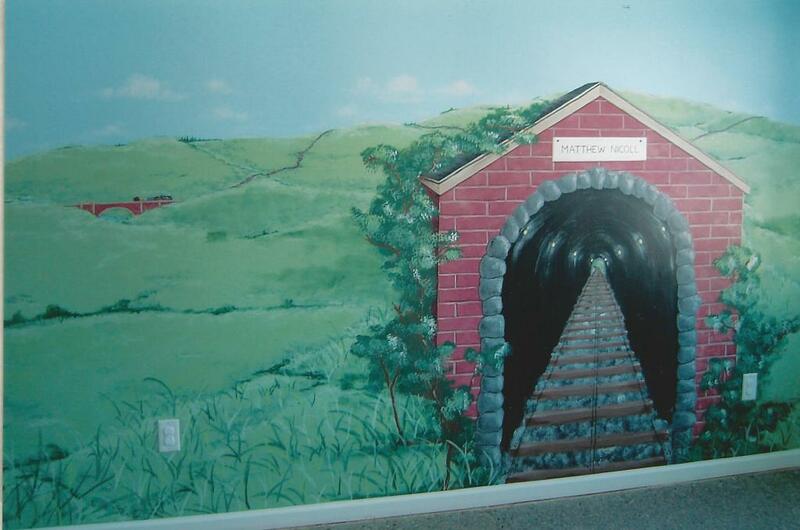 Train-themed mural. 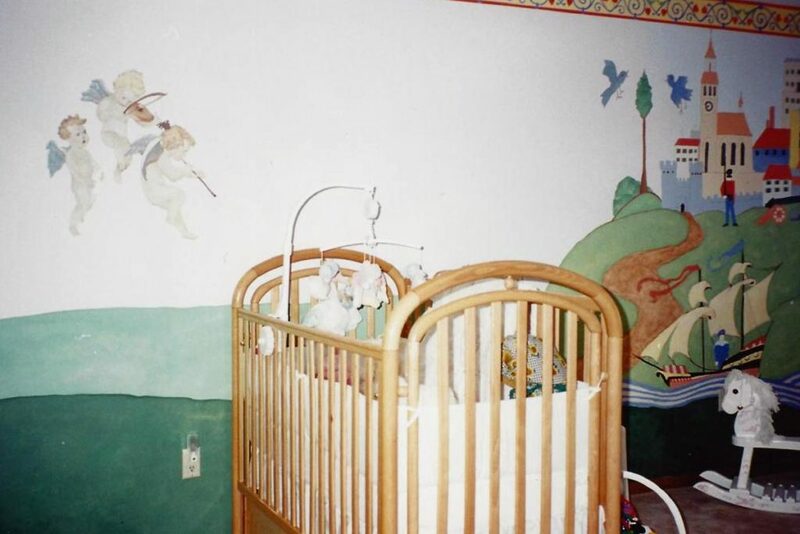 The tunnel was the "headboard" for his bed. 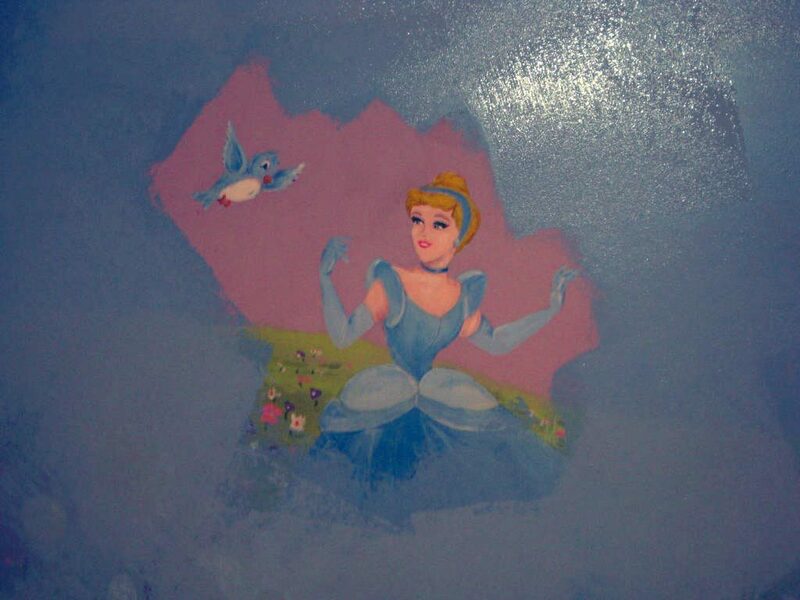 Train mural view next to the entry door. 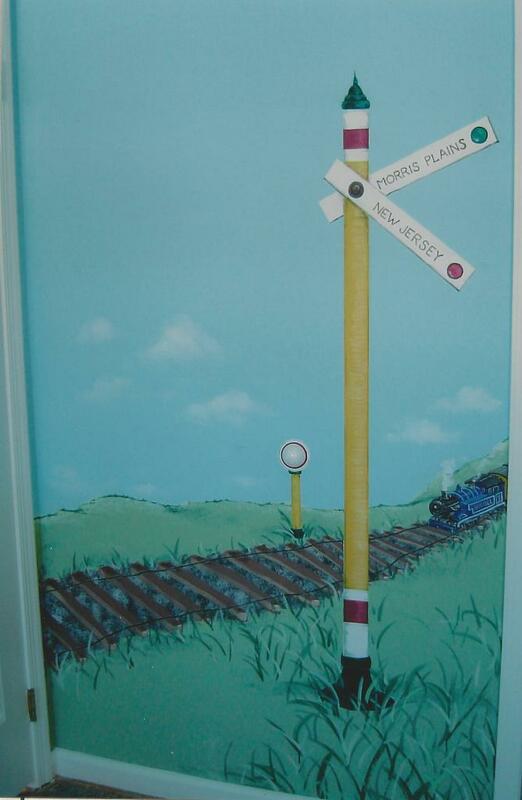 The door's wall protector was made into a signal post. 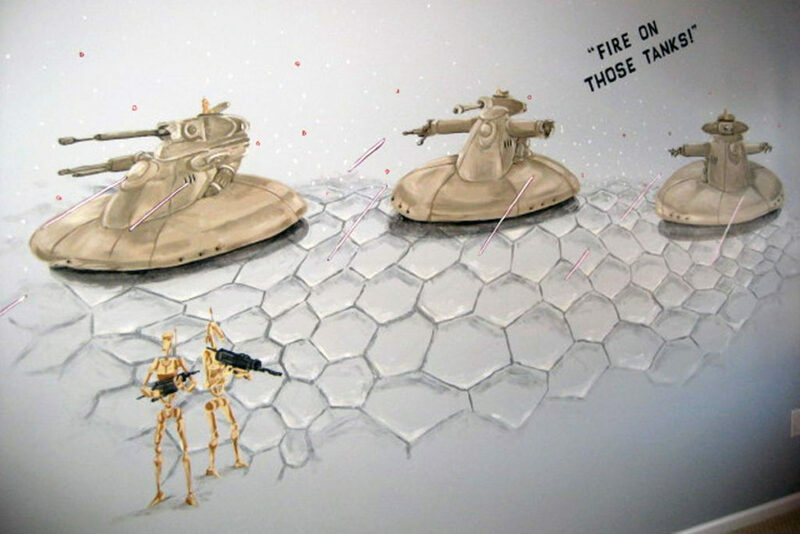 Star Wars “The Clone Wars” mural. 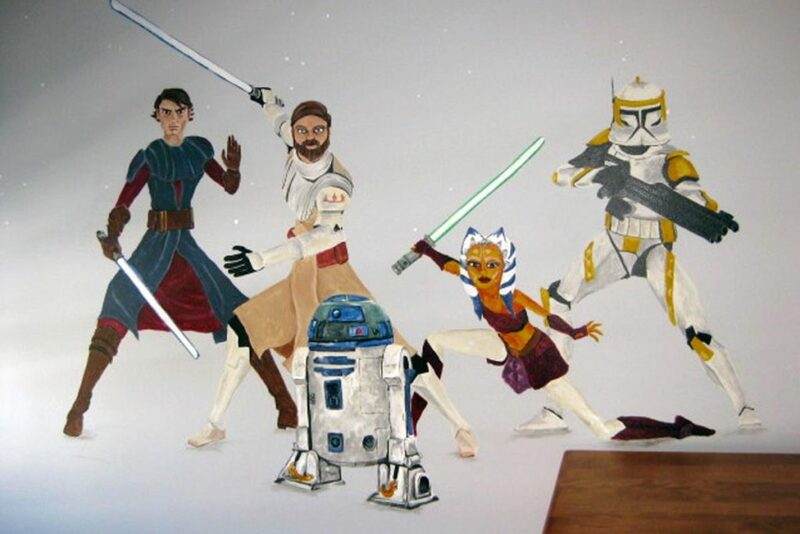 Clone Wars characters painted on opposite wall. 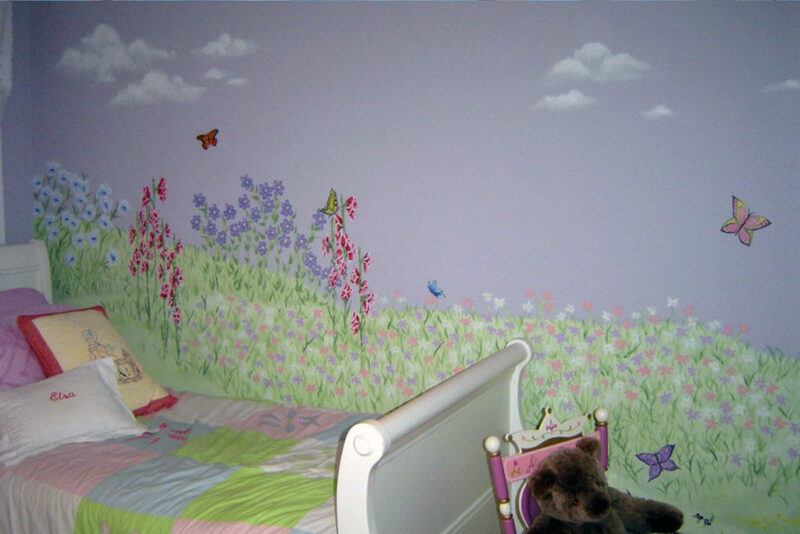 Mural with wildflowers and butterflies. 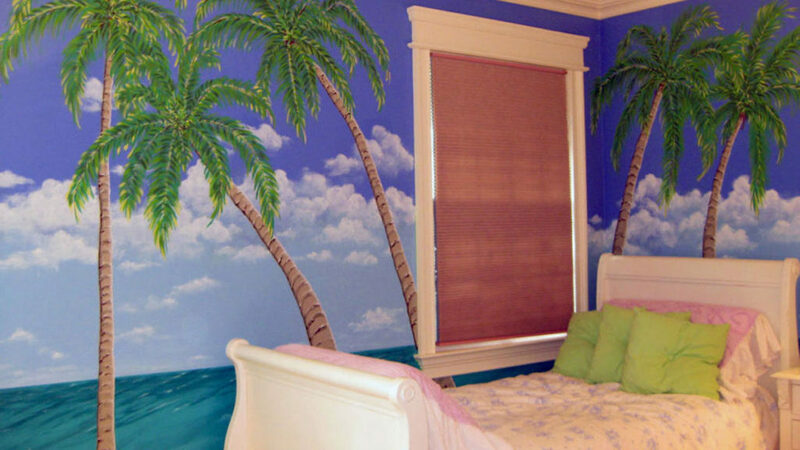 Ocean view with palm trees painted in teen’s bedroom. 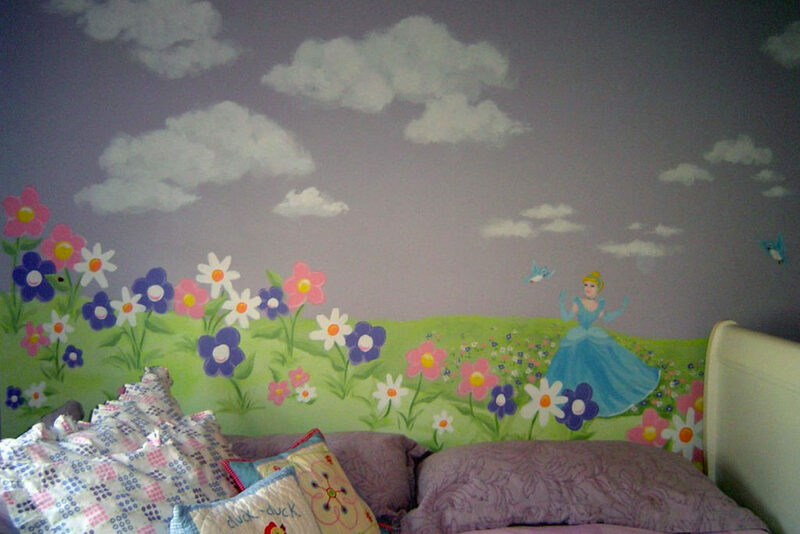 Mural with Cinderella and large flowers. 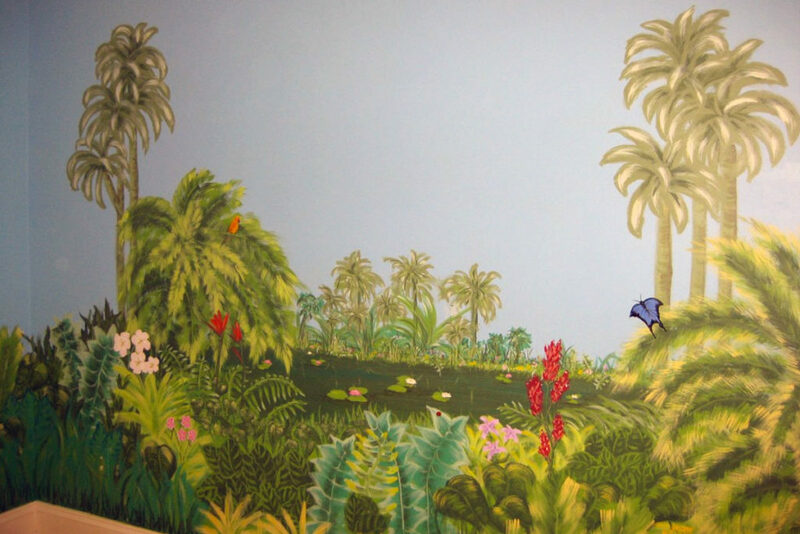 Tropical landscape mural painted throughout bedroom. 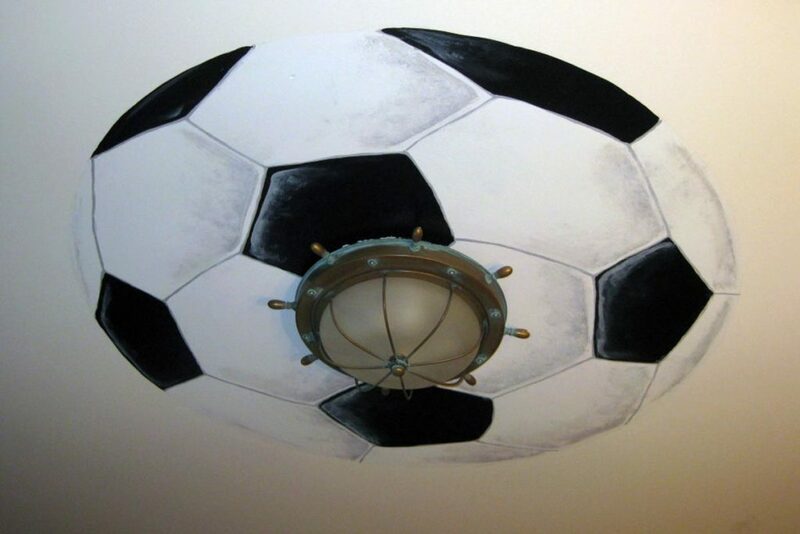 Giant soccer ball painted around light fixture. 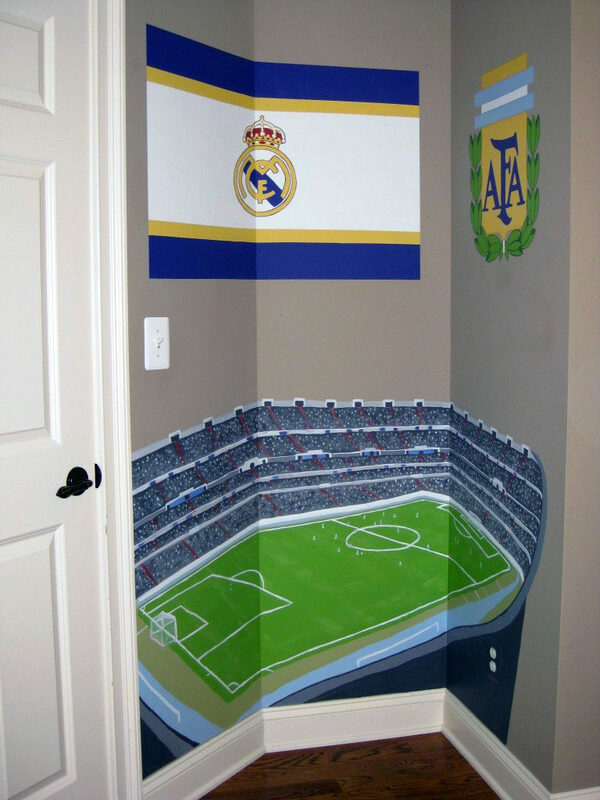 Soccer-themed alcove painted with stadium and two team logos. 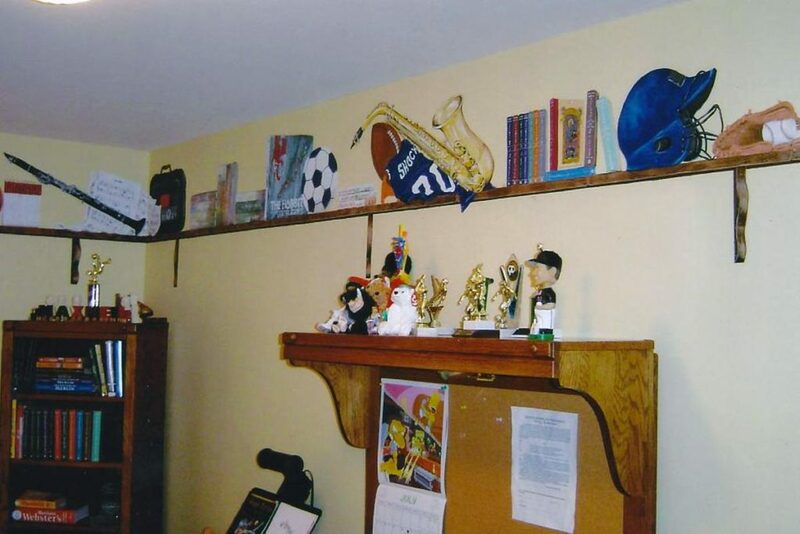 Another view of the focal wall. 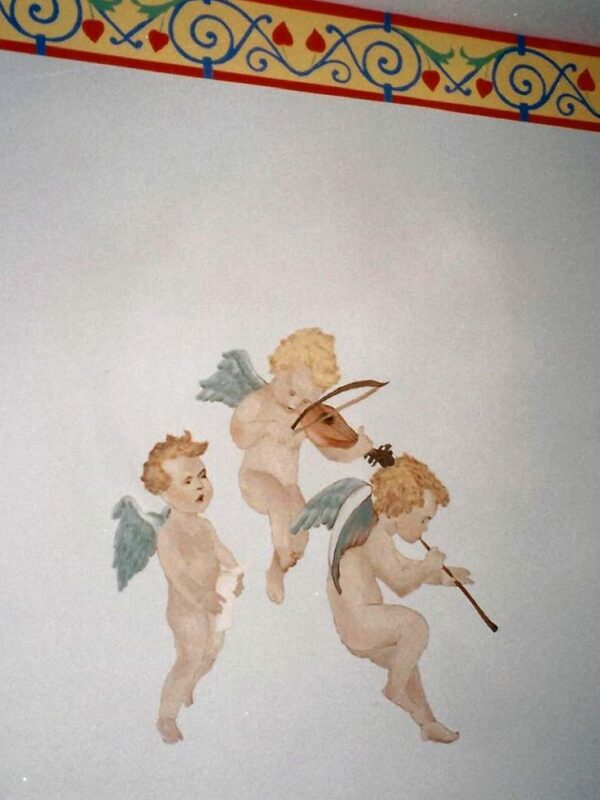 Detail of cupids over the crib. 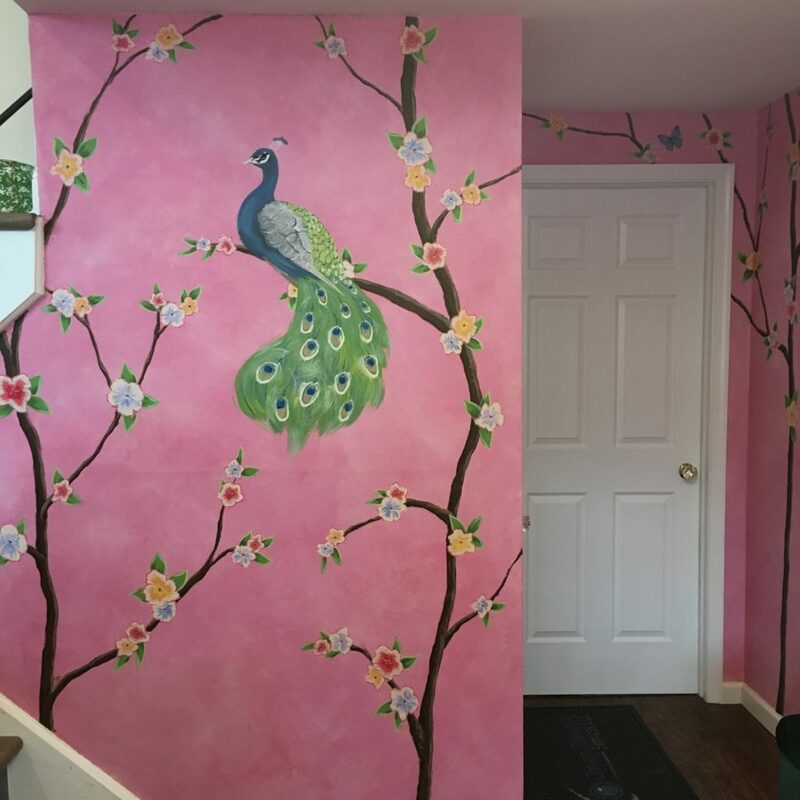 Mural of lavender and blue designs with jewels and glitter. 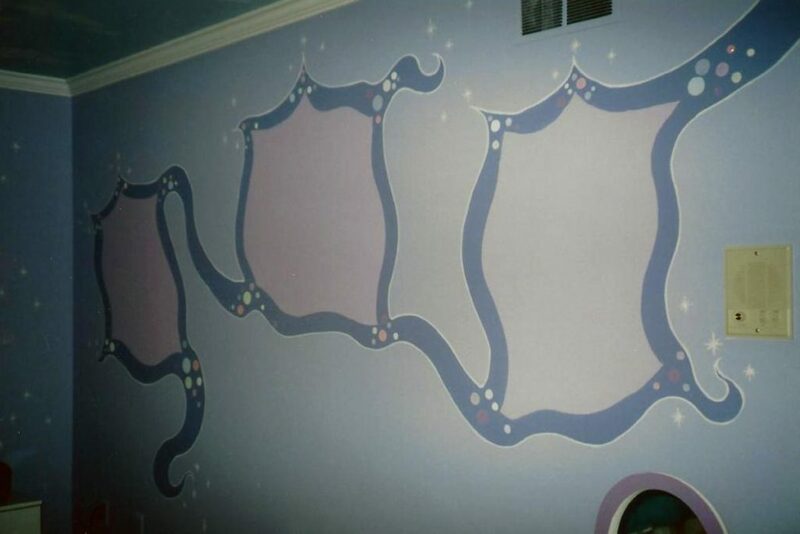 Floating pointy jeweled shapes painted around the room. 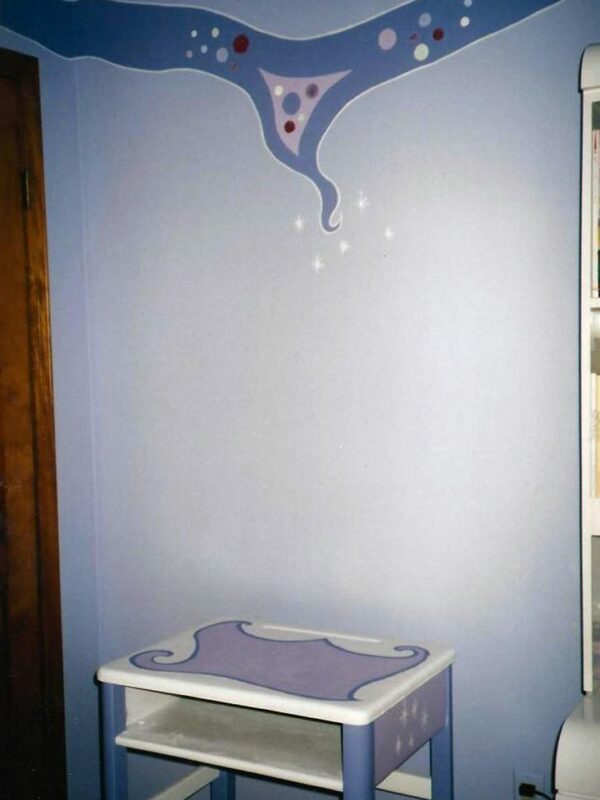 Small writing desk was painted too, to coordinate with the theme. 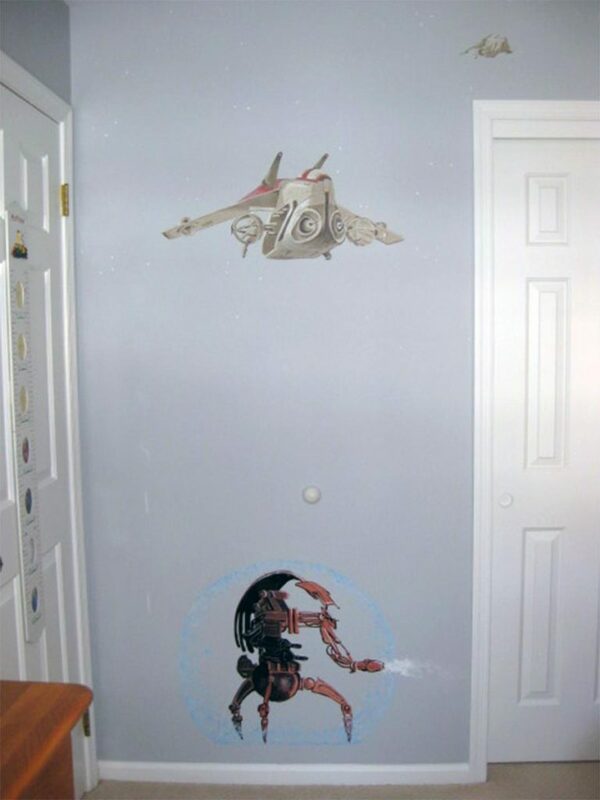 Young Aaron wanted his favorite computer game characters in his faux-window mural. 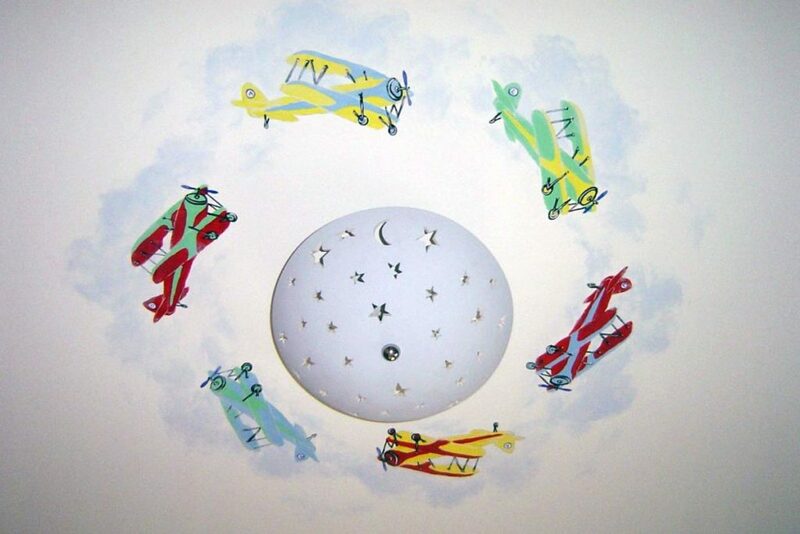 (the waviness seen here is the actual wall-1920’s era plaster). 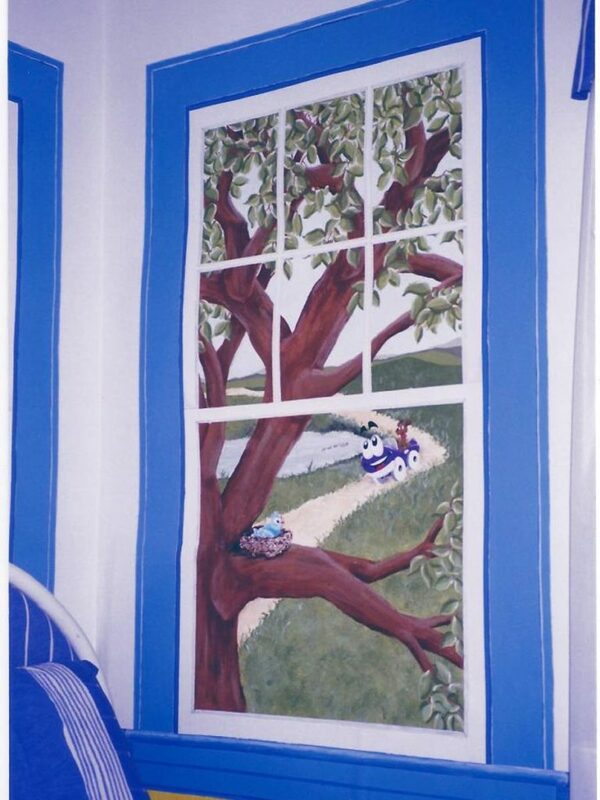 Right-side faux window painted with disney-style bird and “putt-putt” character. 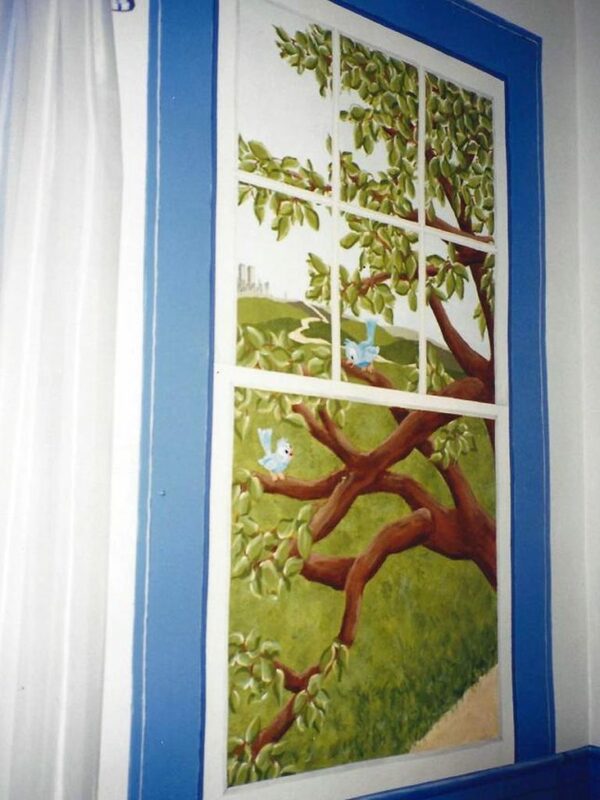 Left-side window painted with birds and view of lower Manhattan. 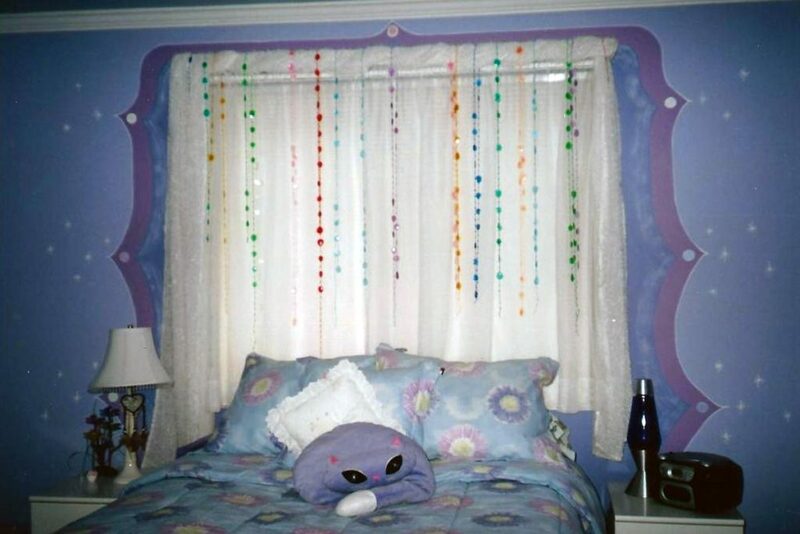 New room, new house. 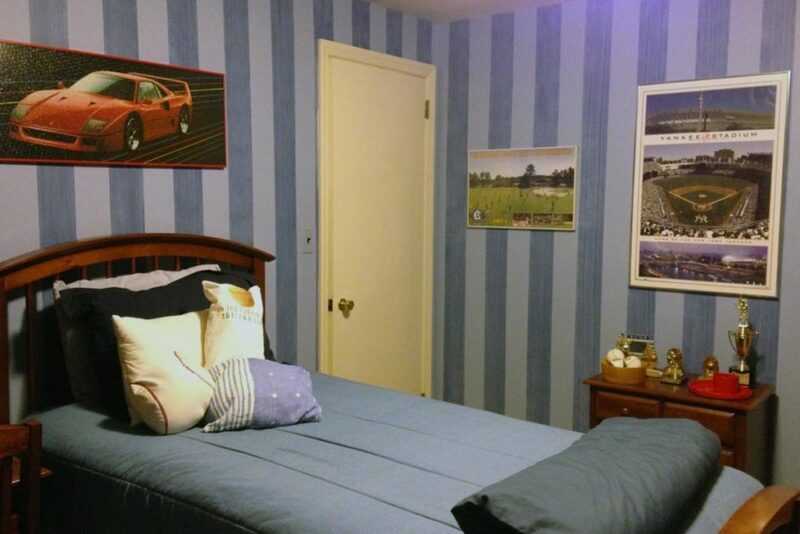 A more mature Aaron requested denim striae stripes.